This piano lesson is dedicated to learning how to form major chords on the piano. We'll start with defining what a chord is, Then we'll explore the Major piano chords and finally I'm going to show you a few examples of major piano chords. We talked about the Musical Interval in the previous piano lesson. We saw that every two notes create an interval that produces a certain musical effect. Today we're going to expend this knowledge by learning what musical effect is created when at least three notes are played at the same time. So let's define what a chord is. A Chord is a combination of at least three notes played at the same time. Each combination of these three notes creates an impression of a mood. 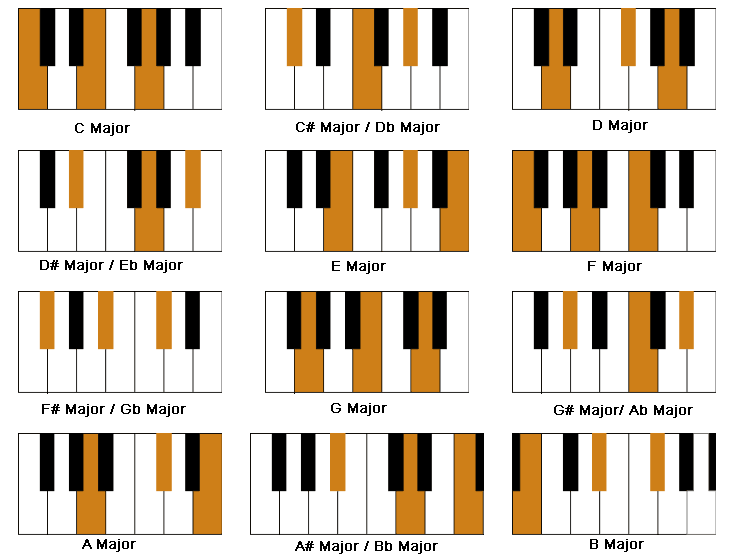 So today we're going to talk about MAJOR PIANO CHORDS. We're going to learn our very three first chords in the next three lessons. It's not a coincidence that I chose to teach you these three chords (C major, F major and G major) for they are very strongly related. We're going to discuss their relationship in the future. The major piano chords are considered to be the optimistic chords (This is a very general statement). Each major chord is named after the key note of the chord. 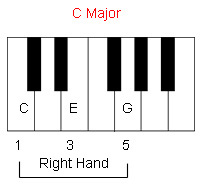 So If you have to play a C major chord for example, you should basically place your right hand thumb on middle C (or any other C on the piano). So now we have to figure the other two notes that create the chord. I like finding chord intuitively. So I would basically skip the D key with my 2nd finger and play the E key with my third finger. An interval has been created. C and E sound together pretty optimistic. Why? That's because they create a major 3rd. How do I know? I checked the distance between them and discovered the the distance between C and E contains 2 tones which makes a major third. That's a great way to find chords. First work intuitively and then approve your intuition with you theoretical knowledge based on what I tought you about musical intervals. Let's continue, Now I have the major third which by the way defines a major chord and I miss another note. Let's try to skip F (the next white key with the fourth finger) and play the G note with the fifth finger. When I play these three notes together C,E and G I'll hear that familiar optimistic sound that connect in my mind with major chords. But I have to be sure. How? If I'll check what intervals is created between E and G I'll find that they make a minor third which is a distance of a tone and a half. So each major chord is built out of the same formula. A major third and a minor third on top of it. this is a powerful tool that will help you to confirm the chord you try to play on piano by ear. So to conclude, It's best to first try finding chord on the piano by ear. First try to find the major third interval with your 1st and third fingers of your right hand. Once you made sure you indeed play a major third (2 tones) add the last note with your pinky and make sure you play a minor third with your 3rd and 5th fingers. 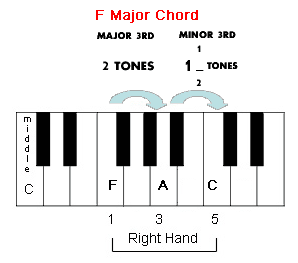 Check the F major chord for example. Play the notes F,A and C with the 1st, 3rd and 5th finger of your right hand (above middle C). Start by checking F and A sound like a major third. Do you hear the optimizm? Check out if they have 2 tones between them? Do they? Yes! So you were right, you created a major third. Now for the minor third. A and C share the distanc of one tone and a half which make the intervals of a minor third. So look how quickly we can play major chords on the piano! So here's how we're going to work from now on. We're going to move to our first piano tutorial after I'll give you some more important details over playing songs with chords. In the piano tutorials I'm going to present the chords that are playing a part in the tutorial. 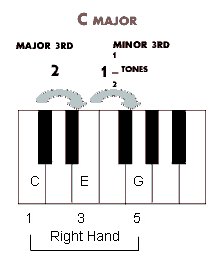 In the next piano tutorial for example, Jingle Bells we'll be playing t hree major chords: C major, F major and G major. In the specific page of each piano tutorial you'll see picture of the chords that are played in the tutorial with links to a page that deals with each specific chord. So try first to find these chords on your own with the help of the piano tutorial and then go through the page of the specific chords if you have some doubts or question. Think of it as the answers to a pretty easy task o.k.? Here's a list of all twelve major chords on the piano (in the root position - If you don't know what that is don't worry... We'll talk about it later in details).